This entry was posted in Current Events, Politics, Society and tagged identity, privilege, voting rights by Lisa Shaw. Bookmark the permalink. You bring up a good point. I’ve read stories of many voters who are no longer allowed to vote because they don’t have the necessary ID according to newly enacted laws in several states. Early voting has also been curtailed, and voting places have been eliminated. All these restrictions were put in place to eliminate ‘voter fraud’, which mostly exists only in the minds of the people enacting the laws. I just finished reading “The Winds of War” and am now into “War and Remembrance” by Herman Wouk, which is an exhaustive history of WWII. He has a lot of details about how the Nazis changed the laws in Germany to rob, disenfranchise and ultimately exterminate the Jews. All of it was done by the book, perfectly legal. First you take away their property, then their right to own it, then their right to work, and so on and so on until you can take away their very lives and nobody can stop you. It could happen anywhere. Yes. And the propaganda machine is, I mean was, in full throttle. Good on you- thus is very hard stuff to think about and you have utterly nailed it. It is so terribly important- I am desparately hoping you get, is it, Freshly Pressed, with this post. Currently Black American men are the population most heavily disenfranchised due to racial profiling, systems that create and purpetuate poverty and crime amongst minorities. And when an entire population is disenfranchised, what choices does it have to make its voice heard? Coordinated violence against the system may be the last resort, but it seems to be preceded by a great deal of self-immolation, which is wasteful and tragic. 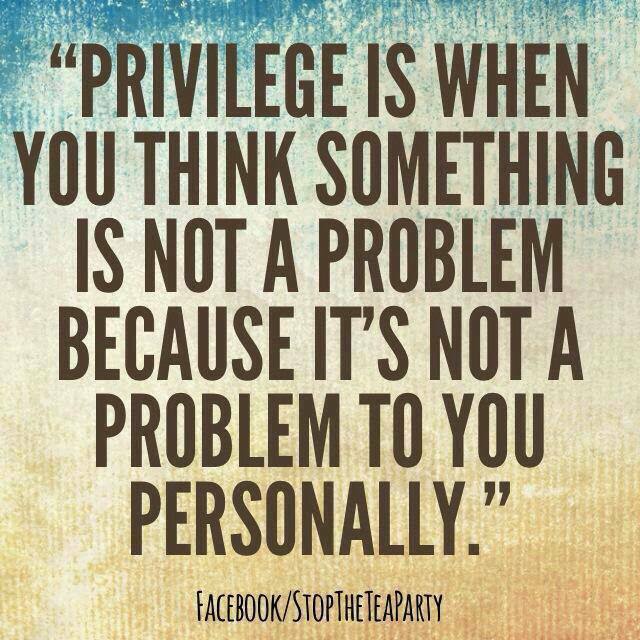 It seems to me that those who are in a position of privilege are morally bound to extend their advocacy, their protection and their voices on behalf of those who don’t enjoy their advantages. One does not have to be gay to support gay rights or a person of color to support civil rights, any more than one needs to be an animal in order to support animal rights. Those who can speak, must speak. Whenever one group of people says to another, “that’s not in any way my problem, that’s exclusively your problem because I am not in any way like you,” that is only selfishness and myopia talking. We’re all in this together. The state cannot ignore/abandon/abuse/repress/subjugate huge swaths of its population and not expect a powder keg, someday, to blow. And that really will be everyone’s problem.